Join this adventure to explore Ecuador and start your surfing in its beautiful waters while learning about the Ecuadorian culture. In this surf camp, you will be coached by experienced surf teachers who will design your courses to support and optimize your skills so you can achieve great progress through the camp! Find new friends in an adventure to new places and begin your surfing style to take it to the next level! During this holiday, you will stay either in a shared or a private room. You have the possibility to choose from three different accommodation options. This program will give you the chance to maximize your learning Spanish by having the support of a local family who will help you adjust and connect to the community and make you part of the culture. This option includes a private room equipped with appropriate storage and a fan, private or shared family bathroom, access to all the household's appliances and services, multiple placements if you are traveling with a friend, and a family guaranteed to make your stay more pleasant and easy. Vegetarian or special requests for meals may be available upon request. This option features a mixed shared house with four rooms that can accommodate from three to four people maximum per room. It's only a few steps from the beach and it also includes hot water, Wi-Fi, a kitchen and barbecue facilities, a ceiling fan, a television with a Digital Video Disk, a private entrance, space for parking, and ample storage. This shared house also has rooms with private or shared bathrooms. Rincón d'Olon offers modern mini-apartments with air-conditioned rooms plus a ceiling fan, a 32-inches television with satellite programming, private bathrooms with hot water, double or queen beds, windows with mosquito screens, a fridge, and free water. The hotel also has a pool, a garden, a roof terrace, and has a restaurant indoors which offers room service. This hotel has suites without kitchen and studio rooms whit a full equipped kitchen. 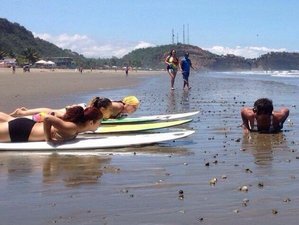 During this surf camp, you will enjoy a total of ten hours of surf lessons. You will be introduced to the surfing world with several courses designed step by step to adapt to your needs as a beginner whether you have tried to surf before or not. You will start to practice on the beach and surf in the whitewash. Then you will also be explained details about the equipment. You will learn the proper placement of paddling and proper paddling techniques. Then you will learn about proper duck-diving and roll techniques, properly stand-up techniques, how to do basic turns, how to time and count waves, and how to stand up on the face of a wave. hi there, this is Luis I'm 30 years old. Outdoor Ecuador Spanish and Surf is a small business located in Olon. I'm a cetificate surf instructor also a Spanish Teacher and i love doing both activities and sharing my knowledge with the people who want to learn and try different experiences. I invited you to visit us and enjoy one of the best beaches in the Ecuadorian coastline which is Olon. This surf camp will take place in Olon, Ecuador. Olon is a small coastal town that boasts a beautiful mountain side to the east and a beach which hosts some of the best waves in Ecuador. Olon is located in the province of Santa Elena, about 220 kilometers northwest of Guayaquil. The Republic of Ecuador is bordered by Colombia to the north, Peru to the south, the Amazon jungle in the east, and the beautiful Pacific coast in the west. The largest tourist attraction to Ecuador is the Galapagos Islands which are located about 1,000 kilometers off the Pacific Coast. Ecuador has a variety of climates and landscapes including mountains, volcanos, jungle, the amazon river, sand-covered coastlines with world class waves for surfing, and plenty of local towns and larger cities that are home to many small sub-cultures within. The coast has a more humid and hot climate, while the Amazon and mountainous regions have an often colder climate as you climb up. You will be served breakfast and dinner if you choose the local living program fee. During this camp, you may visit the many towns both north and south on the coast, rent a bike and head inland throughout the mountains and rivers, hang out in Montanita, and enjoy its famous nightlife. If what you are looking for is something more relaxing, while in Olon, you can enjoy its quiet beach life, softer and less populated waves, and have quiet nights in the local restaurants and pubs. To increase your knowledge of Spanish, you may also take part in the different activities Outdoor Ecuador organizes every week for this purpose. From tournament pools to cooking classes, you will have plenty of opportunities to improve your Spanish by talking to the locals while enjoying yourself in fun activities. Please book your flight to arrive at José Joaquín de Olmedo International Airport (GYE). From Guayaquil terminal you may take a direct bus that comes in six different times per day: 5 a.m., 6 a.m., 9 a.m., 1 p.m., 3 p.m., and 4:30 p.m. This service is provided by CLP and the cost is 5.50 USD per person. This bus is comfortable, clean, and has assigned seats, air conditioning, videos, and a washroom on board. You can also catch a local bus for roughly 4.50 USD, which leaves every 10 minutes. Expect a transfer in Santa Elena which is about 50 minutes to Olon. From Quito, take a bus called "Transporte Ecuador" directed to Guayaquil. This ride will take over six hours and cost 9 USD per person. You can also take a bus to Puerto Lopez which is a small town on the coast north of Olon. From Puerto Lopez, take the bus called La Manglaralto directed to Salinas. Its route is called Ruta del Spondylus and passes Olon within one hour. The ride costs 3.50 USD per person. Taking a taxi from Guayaquil should cost from 100 USD to 150 USD, depending on your Spanish and ability to negotiate. Please make sure the taxi is legitimate. Airport and bus terminals are usually the safest locations to hire a taxi. You may also ask about Outdoor Ecuador services. They have private taxis and shuttles that can get you directly to Olon from Guayaquil for an additional fee in good time and safely. For more information please send them an inquiry. Outdoor Ecuador is a place where cultures connect to study, surf, and travel. They offer Spanish and Surf courses. Also, outdoor activities.